Sitting in Kaldi's with two fellow artists. According to Kim Wardenburg (thepapernest.blogspot.com/) and Kevin Shafer (shaferphoto.com) you're not a true professional until you have a blog. So I'm about to blitzkrieg this blog with stuff I have recently done. 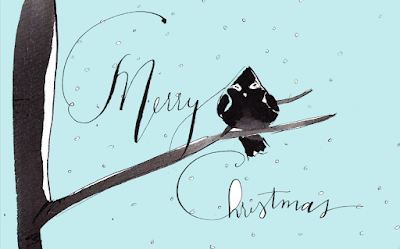 A little Christmas bird incorporating my new found love...calligraphy.